Does your pedicure thrones drains slowly, have a dripping nozzel or the massage pump doesn't work like it used to? Drake Mechanical can help you out. Whether it is your pedicure sinks massage pump, changing out the pedicure sink faucet or any other accessories Drake Mechanical can get your pedicure sink back to working like it was designed and you back to your satisfied customers! If you are looking at adding a Boise pedicure sink and do not have one yet we can help with that as well. Whatever aspect that you need taken care of for your salon or barber shop Drake Mechanical is your one stop shop. From shampoo sinks to hair traps and central vacuums we can litteraly take care of all you salon plumbing needs. We can help you pick out whatever kind of sink you need and get it installed, from rough in to final completion we will handle your installation and modifications professionally, quickly and with as little disruption to your business as possible. Give us a call with any questions and we will meet you on site and go over what your wants and concerns are and get you all fixed up. 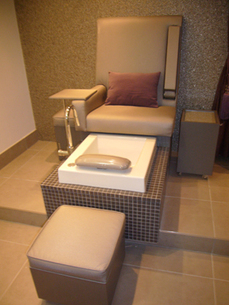 Here are a few of the locations where Drake Mechanical regularly works on installing and repairing pedicure sinks. and pedicure sinks anywhere in between.